“What would Gandhi say?” she said to me during a discussion that ranged from India to Nepal to Gaza about how poor grassroots women should propel themselves in a non-violent way out of poverty and into self-reliance and freedom. For the past 40 years, this soft-spoken and unassuming-looking woman has been a lightening rod for the empowerment of grassroots women not only in India but also across the developing world. After receiving in Washington a Global Fairness Initiative Award given by Hilary Clinton, she was in Canada to visit her sister who teaches psychiatry at McMaster University, and I had been invited to spend some time with her. I had first met Ela Bhatt back in 2008 in her home city of Ahmedabad in the state of Gujarat in between my meetings with SEWA street vendors, embroiderers and construction workers. Once again I felt humbled to be in the presence of this community development advocate whose belief in the capacity and wisdom of marginalized women has sparked the most impressive network of cooperatives in India. Right from the beginning, in her city of Ahmedabad, she empowered poor illiterate women by recognizing their pivotal role as mothers and householders while also laboring at low pay to feed their children. After massive layoffs during the 1970s of men in the textile industry, thousands of Ahmedabad women became the sole support of their families. Fresh out of law school and working for a textile union, she inspired 6,000 exploited and impoverished rag pickers, head loaders, and street vendors to contribute 10 rupees each to kick off what became the most progressive women’s cooperative bank in the world. Under her Gandhian guidance, women in occupations ranging from rag pickers to farmers and midwives also created over 100 cooperatives financed and run by the women themselves. Most crucial for poverty alleviation and community development is how the women sought to grow. “Men want to think big,” she said, “but women expand laterally into the community and plan inclusively so that growth is sustainable. Ela sees a direct connection between women, livelihoods (as opposed to work) and community, but finds that often rigid regulations can hinder this from flourishing. For example, recently, SEWA’s Ahmedabad street vendors were poised to set up a mall in Ahmedabad to sell organic fruits and vegetables from SEWA farmers to a high-end market. However, a municipal ruling forcing farmers to deal exclusively with a wholesale farmers market stopped them. In the tradition of SEWA activists, who have succeeded in changing laws, this directive is expected to be modified. Looking beyond the local, Ela has also worked across India on issues related to microcredit and community development. In 1999, she co-founded Sa-Dhan, an association of community development financial institutions and later helped found an Indian school of microcredit for women. In the South Asia region, she played a key role in creating Homenet South Asia to protect the 40 million home based women in South Asia that make garments and crafts. Founded in January 2007, Homenet South Asia promotes better labour conditions and social services and also sells products made by the women for export under fair trade in mainstream markets. 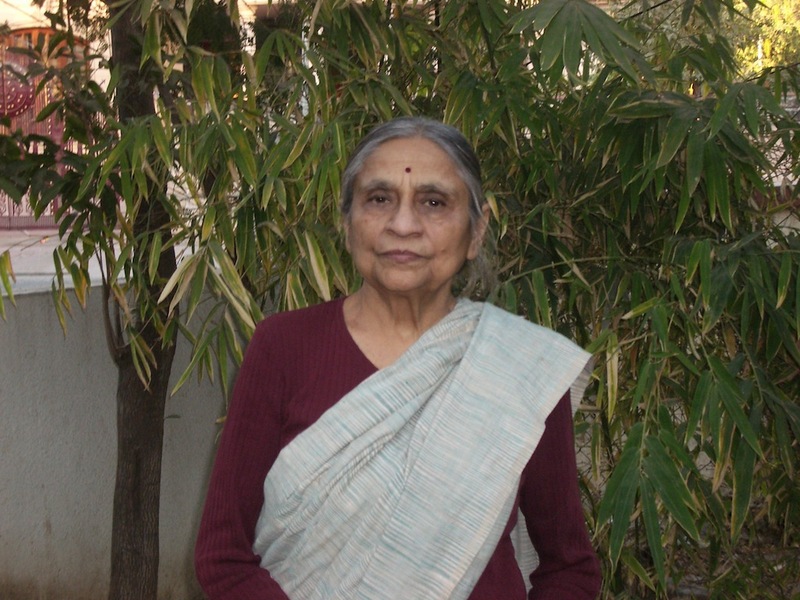 Called the “gentle revolutionary” Ela Bhatt remains a world player against poverty. In 1979, in the wake of the 1975 first international women’s year conference, held in Mexico, she and other women visionaries founded Women’s World Banking, a non-profit organization based in New York City that works globally to provide financial services to poor women and their families. In 2007 she became a member of The Elders, an international assembly of noted public figures named by Nelson Mandela to promote peace and human rights. Others include former U.S. president Jimmy Carter, Graca Machel, a social and political activist from Mozambique, and former president of Ireland Mary Robinson. “I would like to see Gaza end its dependence upon the outside as much as possible…” Advocating non-violence, she added, “I am reminded of Gandhiji who taught us that self-reliance is the path of freedom; if people are dependent on others and believe themselves to be victims, they will be treated as victims.” What would Ghandi say? | The Elders. “But,” she concludes, “we must honour the feminine in men. In the trade union movement, many men are sympathetic to these issues.” And she points to Rahul Gandhi in India and Barak Obama in the U.S. as exemplars of the peace-building approach typical of women.